Also, how Malaysian Anglophiles, the MKinis and the Joshies, permit themselves to be used. Genuine dissident or your money back: Free the man? Of course. And the Norwegians can have their money back? Americans too? What would the orang putih, the Dean Johns know about Liu Xiaobo. In November 1988, I had just finished a three-month visit to Oslo University (Norway) and I was heading to University of Hawaii (USA). I deliberately chose to go through Hong Kong. It felt great to visit the free port created by colonialism for the first time! …more than 300,000 websites now link to the charter, and it’s being discussed on blogs, QQ (a popular Chinese instant message service and website) groups, and other chat rooms. “It’s impossible to block information in society now,” (says Zhang Zuhua). I looked for “零八宪章” on Google.com, and I got 328,000 results. This is most likely the 300,000 number that Zhang Zuhua is referring to in the CSM article. Having your internet access censored is not a good life. It is a life that builds barriers around free will. It is a life based on mistrust. Imagine typing Raja Petra in the Google search engine and receiving the irritating “Internet Explorer cannot display the webpage” message. This is what people in China experienced recently when they ran a Google search for Li Rui, Mao Zedong’s former secretary. Extrapolating, he is also saying he can’t access Liu Xiaobo through Google, and in English. Since he probably can’t write Chinese well, or at all, had he typed in his father’s name in Swahili? Or did he typed in his mother’s name using Google Translate which might give him this: 婊子. “Imagine,” like David says, searching Google with his mother’s name, 婊子. In 2007, Liu stated that he did not want to take back what he had said in 1988, because it reflected a belief he retained. He attributed progress in China to Westernisation and said the more that Westernisation existed in the various spheres of Chinese society, the more progress was attained. He is either woefully ignorant of the nature of colonialism, which involved legally mandated racial discrimination and the colonisers’ political and economic monopolies, or Liu finds it a congenial alternative because he is convinced of Western superiority. This can hardly be expected to be a sentiment shared by most Chinese. 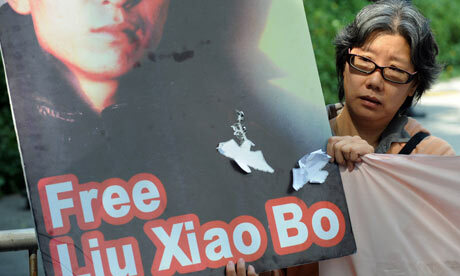 Is Liu Xiaobo the mistake or is it the prize? Liu Xiaobo has, as far as I know, never contributed in any conflict-reducing activity or take part in peace-related activities. I therefore cannot see that the peace prize winner fulfills the most important criteria in Nobel’s testament. Therefore it is a mistake. – Arnulf Kolstad, Norwegian University of Science and Technology. Liu Xiaobo got 11 years in the slammer. Question: where is the evidence he is sitting in jail purely out of free speech, and peaceful ones at that? Like Malaysiakini, Liu Xiaobo received money from the National Endowment for Democracy, a CIA front used for rechannelling funds distributed by the US Congress. Does that explain why Josh Hong and Mkini like Liu Xiaobo: a common, American interest? The prize is awarded not by an international group of specialists in peace studies or human rights (Norway alone has quite a number), but by five retired Norwegian politicians. These are all white and, presumably, well-off. They currently represent the five largest Norwegian political parties, one from the left, two from the center-left, and two from the right, according to conventional Norwegian characterizations. The two right-wing parties and one of the center-left parties are for sharply restricting immigration to Norway, at least from outside Europe. The head of the Nobel Peace Prize committee has promoted the idea of Norway sending more troops to fight in Afghanistan. There are bigger fish to fry than Liu Xiaobo.